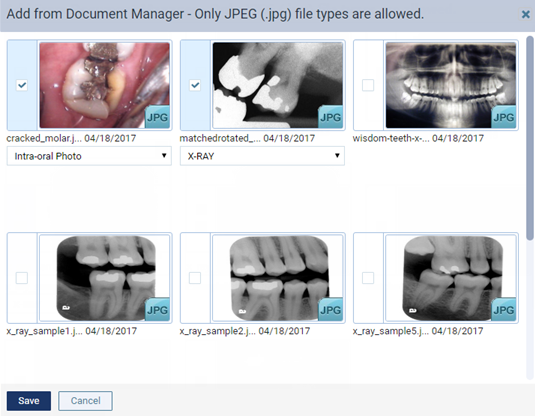 You can attach a patient's perio exam and the images from a patient's document manager to a claim that has not been submitted (does not have a status of Queued, Sent, or Accepted) or that was rejected (has a status of ADDINF, NEARERROR, or so forth). For information about adding attachments to rejected claims, see the topic about resubmitting rejected claims. Note: Only .jpg/.jpeg files from a patient's document manager are valid for images that you want to attach to claims. You can attach only one perio exam to any given claim, but you can attach a perio exam to multiple claims. You can have up to a total of 10 attachments per claim. Important: Henry Schein One maintains a database of supported payers. 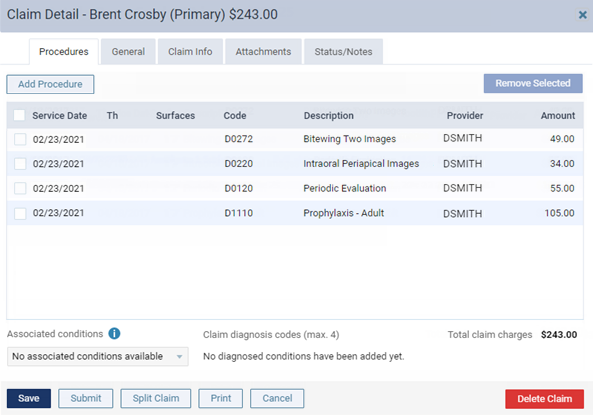 You can add attachments to claims only for insurance plans that are associated with supported carriers. However, if a payer does not accept electronic attachments, when you send a claim with attachments to that payer, the attachments will not be included, and the claim will have a status message that states that the attachments were rejected. If this is the case, you can mail the attachments to the payer separately from the claim. Alternatively, for payers that don't accept electronic attachments, you can print and mail the claim and attachments together. Click (or tap) the Attachments tab. The options for adding attachments become available. Add images from the patient's document manager. Click (or tap) Add From Document Manager. This button is not available if the payer for this claim is a non-supported carrier (a carrier that was manually added to your practice database not from the list of supported carriers that Henry Schein maintains; it has payer ID of 06126). The Add From Document Manager dialog box appears. Select the check boxes of the images that you want to attach to the claim. Select a classification/type for each selected image. Tip: If necessary, you can change the classification/type later by selecting a different option from the Classification/Type list on the Attachments tab. Add the patient's perio exam. Click (or tap) Add Perio Exam to view a menu that lists the dates of the patient's perio exams. This button is not available if the payer for this claim is a non-supported carrier (a carrier that was manually added to your practice database not from the list of supported carriers that Henry Schein maintains; it has payer ID of 06126) or if the patient does not have any perio exams entered in his or her record. Click (or tap) the date of the perio exam that you want to attach to the claim.